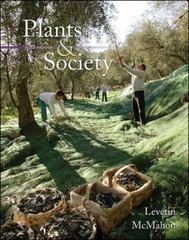 Plants and Society 5 Edition This introductory, one quarter/one-semester text takes a multidisciplinary approach to studying the relationship between plants and people. The authors strive to stimulate interest in plant science and encourage students to further their studies in botany. Also, by exposing students to society's historical connection to plants, Levetin and McMahon hope to instill a greater appreciation for the botanical world. Plants and Society covers basic principles of botany with strong emphasis on the economic aspects and social implications of plants and fungi.